Drs. 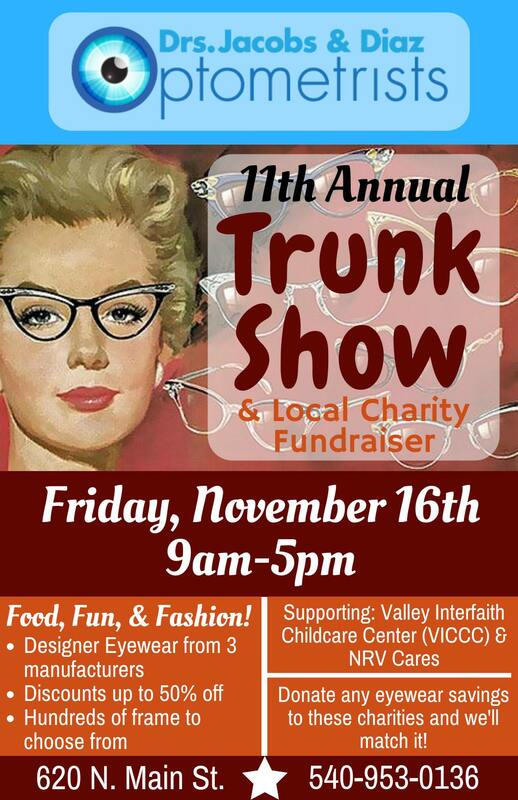 Jacobs and Diaz Optometrists presents the 11th Annual Eye Wear Trunk Show and Local Charity Fundraiser on Friday, November 16, 2018. Enjoy food, fun and fashion! Three major eyewear manufacturers will feature their goods at savings up to 50% with hundreds of frames to choose from. There’ll be delicious food, plenty of fun and representatives from two of our community’s vital child-oriented non-profits: Valley Interfaith Child Care Center (VICCC) and NRV Cares. Any eyewear related savings donated to these groups by patrons during this event will be matched by Dr. Jacobs. We can’t process eyewear insurance benefits on the day of show, but if you find something you like we can process it on Monday. If you’ve joined us before, you know how much fun it is. If you haven’t, there’s no reason to deprive yourself any longer! To view the event flyer, visit: https://i.imgur.com/XbOQiwU.jpg. Drs. Jacobs and Diaz Optometrists is located at 620 North Main Street in Blacksburg, VA.
For more information, visit: http://www.stevejacobsod.com/ or https://www.facebook.com/stevejacobsod or call 540-953-0136.